Healthcare-associated infection (HCAI) has become a potential threat worldwide. HCAIs can cause increased morbidity and mortality of the patients and increase treatment cost, especially in developing country like ours., Moreover, with the advent of multidrug-resistant (MDR) bacteria, HCAIs are now very difficult to treat. Cross-transmission of infections in between patients by health-care workers (HCWs) also plays a role. Staphylococcus spp., especially, methicillin-resistant Staphylococcus aureus (MRSA) is one of the frequent causes of HCAIs. S. aureus colonizes various places and mucous membrane of the human body, mostly at anterior nares. This way a healthy human become a carrier of S. aureus. The colonized HCWs can act as carrier as well as reservoir of S. aureus. They become major sources of S. aureus transmission between patients. Especially, vulnerable patients in the operation theater (OT), Intensive Care Unit (ICU), and postoperative wards are susceptible for spread of microbial resistance from HCWs. Coagulase-negative Staphylococci (CoNS) were previously considered as contaminants. They now emerge as opportunist nosocomial pathogens for hospitalized patients. CoNS are causing several HCAIs including bloodstream infection. CoNS are similarly colonized in different parts of the skin and mucous membranes of the HCWs. Methicillin resistance becomes common to CoNS causing difficulties in treatment policies. The MRSA carrier stage and rate among HCWs are much talked about. It ranges from 16.8%–90% in different countries., However, carrier stage, colonization of MR-CoNS among HCWs is poorly reported. This study is therefore undertaken as part of a hospital infection control surveillance program of our tertiary care center. Because nasal carriage of MDR bacteria among HCWs has become a significant issue, it demands further study/investigation. Institutional ethical committee clearance was taken for this surveillance study. Written and informed consent was taken from each HCW participating in the study. The sample size of the study was planned using the “sample size determination in health studies software” of the World Health Organization (WHO). Specimens were taken from anterior nares of HCWs (doctors, nurses, sweepers, ward boy, and OT assistant) working in ICU and OT and ward. Staffs having rhinorrhea/rhinitis, pharyngitis, upper respiratory tract infection, and who were on oral antibiotics were excluded from the study. With gloved hands, sterile cotton wool swab stick with plastic transport tube was taken and swab was removed. Swab was premoistened with nonbacteriostatic normal saline. HCW was asked to tilt the head back and swab was gently inserted into the nostril and rotated against the anterior nasal mucosa for 3 s. Using the same swab, the procedure was repeated for other nostril and placed into plastic transport tube. Plastic transport tube was labeled with appropriate information. These swabs were inoculated on the 5% sheep blood agar and mannitol salt agar without delay. Colony characteristics on the culture plates and Gram-staining were used to further confirm the identity of S. aureus. Salt tolerance and mannitol fermentation properties of S. aureus result in the typical yellow colonies due to a change in the pH. Gram staining helped to ascertain that there were no other airborne contaminants by confirming the characteristic morphology of S. aureus. Catalase, dimethyl sulfoxide oxidase, deoxyribonuclease, and coagulase tests helped to identify species of S. aureus. Growth of any other microorganisms was noted but excluded from analysis. Antibiogram was made by the Kirby–Bauer Disc Diffusion Method as per the Clinical and Laboratory Standards Institute Standards. The zone diameters were interpreted against the following antibiotics – penicillin G (10 units), ampicillin (10 mcg), erythromycin (15 mcg), tetracycline (30 mcg), gentamicin (10 mcg), vancomycin (30 mcg), co-trimoxazole (1.25/23.75 mcg), ciprofloxacin (10 mcg), linezolid (30 mcg), and imipenem (10 mcg). Methicillin resistance was detected using cefoxitin 30 μg disc (HiMedia Labs, India). Zone of inhibition of size <21 mm for S. aureus and <24 mm for CoNS was considered as resistant. Information on MRSA and MR-CoNS was disseminated in health education sessions to complement the findings of the study. A total of 240 HCWs were targeted. Nine HCWs were excluded due to rhinitis and respiratory tract infection, 2 HCWs were on oral antibiotics, 7 negatively consented, and 8 samples were discarded due to plate contamination. 214 samples from anterior nares were analyzed from ICU, OT, and wards. 84 samples from doctors' anterior nares, 74 samples from nurses' anterior nares, and 56 samples from sweepers and ward boys' anterior nares working in ICU, OT, and wards were collected. Among 84 anterior nares samples of doctors, 97.6% showed growth of Staphylococcus spp. Of them, 11 (13%) were MRSA and 35 (41.6%) were MR-CoNS MRSA was 7%, 23%, and 15% from anterior nares of doctors posted in ICU, OT, and ward, respectively. MR-CoNS was 43%, 31%, and 41% from anterior nares of doctors posted in ICU, OT, and ward, respectively [Table 1]. Among 74 anterior nares samples of nurses, 93.2% showed growth of Staphylococcus spp. Of them, 5 (6.7%) were MRSA and 24 (32.4%) were MR-CoNS. There are no MRSA found in anterior nares samples of ward nurses. MRSA was 4%, 13%, and 0% and MR-CoNS was 55%, 27%, and 12% from anterior nares of nurses posted in ICU, OT, and ward respectively [Table 1]. Among 56 anterior nares samples of sweepers, 94.6% showed growth of Staphylococcus spp. Of them, 8 (14.2%) were MRSA and 18 (32.1%) were MR-CoNS. 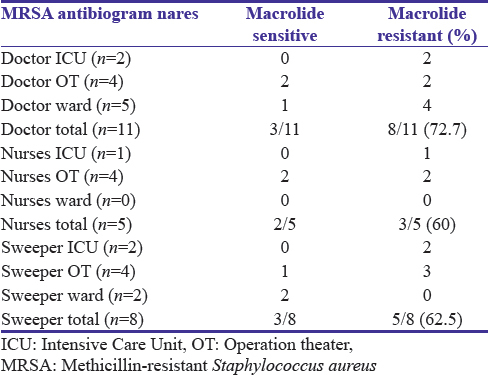 MRSA was 10%, 11%, and 23% and MR-CoNS was 37%, 26%, and 35% from anterior nares of sweepers and ward boys posted in ICU, OT, and ward, respectively [Table 1]. MRSA was 13%, 6.7%, and 14.2% in samples obtained from anterior nares of doctors, nurses, and sweepers, respectively. MR-CoNS were 41.6%, 32.4%, and 32.1% in samples obtained from anterior nares of doctors, nurses, and sweepers, respectively. There is no statistical difference of MRSA and MR-CoNS nasal carriage in between groups. Of all MRSA found in anterior nares of doctors, 72.7% of MRSA were also macrolide resistant. Of 72.7% of macrolide resistance, 10% is inducible resistance. Of all MRSA found in anterior nares of nurses, 60% of MRSA were also macrolide resistant. Of 60% of macrolide resistance, all are constitutive resistant. MRSA found in anterior nares of sweepers, 62.5% of were also macrolide resistant. Of 62.5% of MR, 11% is inducible resistance [Table 2]. Of all MR-CoNS found in anterior nares of doctors, 54.2% was also macrolide resistant, 2.8% were also macrolide and linezolid resistant, and 2.8% were also macrolide and levofloxacin resistant. Of 54.2% of macrolide resistant, 10% is inducible resistance [Table 3]. Of all MR-CoNS found in anterior nares of nurses, 66.6% were also macrolide resistant. Of 66.6% of macrolide-resistant MR-CONS, all are constitutively resistant [Table 3]. Of all MR-CoNS found in anterior nares of sweepers, 50% were also macrolide resistant and 5.5% were also macrolide and levofloxacin resistant. Of 50% of MR, 11% is inducible resistance [Table 3]. Healthcare-associated infections are of major public health importance worldwide. They can occur in all health-care settings with an estimated 3.5%–12% of hospitalized patients affected in developing countries (WHO, 2011). The presence of MDR bacteria, especially S. aureus on hands with healthy skin usually represents contamination because these bacteria rarely multiply and persist at this site. Nasal carriage of MDR bacteria was a risk factor for carrying them on the hands. The mechanism probably involves self-inoculation by fingers touching the nose. In this study, it was found that (212) 99% of the HCWs had colonization in their nose. There was a high carriage rate of Staphylococcus spp. in anterior nares (204) 95.3% of HCWs. Doctors were found to carry Staphylococcus spp. in 97.6% of anterior nares samples (n = 84). The most predominant MDR organism found to colonize them were MR-CoNS and MRSA. Of these, 13% were MRSA and 41.6% were MR-CoNS. Nurses and sweepers were found to carry Staphylococcus spp. in 93.2% (n = 76) and 94.6% (n = 56) of anterior nares sample, respectively. Of these, the most predominant MDR organism found to colonize were MR-CoNS and MRSA. Nurses had 6.7%MRSA and 32.4% MR-CoNS in their anterior nares. Similarly, sweepers had 14.2% MRSA and 32.1% MR-CoNS in anterior nares. Anterior nares of doctors and sweepers were found to be more commonly colonized with MDR Staphylococcus spp. in comparison to nurses. This problem in resident doctors could be because of long duty hours, heavy workload, poor hygiene, and sometimes reluctance to practice hand hygiene. Similar problem in sweepers could be because of unawareness of infection control practices among them. A recent screening study of nasal carriage of S. aureus by staff members was carried out at a public hospital in Argentina, 2017. Of the 320 HCWs, they found 96 (30%) were nasal carriers of S. aureus, 6.3% (20) of whom carried MRSA. MRSA was widely resistant to macrolides, quinolones, and however, were sensitive to sulfamethoxazole-trimethoprim or vancomycin. Our study showed that the nasal carriage of S. aureus as well as MRSA was higher among HCWs. The resistance patterns of S. aureus were also different. The difference between study outcomes in Argentina and study like ours may be attributed to the strict infection control practices that are followed over there and also to the better doctor to population ratio. In an Indian study done in tertiary care center in Assam 2013, Rongpharpi et al. sampled 315 nasal swabs. In their study, they isolated nasal carriage of S. aureus in 22.22% (70) cases. Methicillin resistance was seen in 11.43% (8) of the S. aureus isolates. Nasal carriage of CoNS was 42.86% (135) in their study, but they have not disclosed percentage of MR-CoNS. The prevalence of S. aureus was higher among the male HCWs (54.28%) than the female HCWs (45.71%). All the S. aureus isolates were found to be sensitive to vancomycin and linezolid. Our study showed higher MRSA nasal carriage among HCWs. In 2011, Kumar et al. did nasal swab of 84 HCWs of ward, OT, and ICU in Aligarh, India. 78.6% were positive for S. aureus. The nasal carriage of MRSA was observed to be 83.3% (15) among doctors and 16.6% (3) among laboratory technicians. Nasal carriage of CoNS was 39.3% (26). In our study, 13% of doctors had nasal carriage of MRSA, while 6.7% and 14.2% of nurses and sweepers had nasal carriage of MRSA, respectively. In 2013, Edem et al. designed a study to ascertain the frequency of bacterial colonization and the antibiotic sensitivity pattern of the isolates from the anterior nares of HCWs in a teaching hospital, Nigeria. They analyzed 30 nasal samples and their study revealed that 93% of HCWs carry Staphylococcus spp. in their nostrils and 20% (6) showed MRSA colonization in their noses. Staphylococcus spp. were found to be sensitive to clindamycin (80%), followed by ciprofloxacin (77%). An Indian study of 2016 described methicillin- and mupirocin-resistant MR-CoNS from nasal swabs collected from various categories of 210 HCWs in equal representation. Of 210 swabs, 69 (32.8%) were CoNS and 16 (7.6%) were MR-CoNS isolates. Their MR-CoNS strains showed resistance against antibiotics such as penicillin (100%), rifampin (88%), clindamycin (69%), co-trimoxazole (63%), and erythromycin (56%). Our study showed higher rates of MR-CoNS carriage, 41.6% among doctors and 32.4% and 32.1% among nurses and word boys, respectively. The study showed that the HCWs including doctors, nurses, OT assistant, sweepers, and ward boys were carrier for MDR organisms such as MRSA and MR-CoNS. Our study created awareness among HCWs by educating them about nasal MDR organism carriage, especially MRSA and MR-CoNS and different measures to eradicate it. Our study gives an overview of the nature of MRSA and MR-CoNS isolates in this portion of India for epidemiologists. Our tertiary care hospital, however, needs to develop more stringent hospital infection control policies. Boncompain CA, Suárez CA, Morbidoni HR. Staphylococcus aureus nasal carriage in health care workers:First report from a major public hospital in Argentina. Rev Argent Microbiol 2017;49:125-31. Rajaduraipandi K, Mani KR, Panneerselvam K, Mani M, Bhaskar M, Manikandan P, et al. Prevalence and antimicrobial susceptibility pattern of methicillin-resistant Staphylococcus aureus: A multicentre study. Indian J Med Microbiol 2006;24:34-8. Albrich WC, Harbarth S. Health-care workers: Source, vector, or victim of MRSA? Lancet Infect Dis 2008;8:289-301. Edem EN, Onwuezobe IA, Ochang EA, Etok CA, James IS. Antibiogram of bacterial isolates from the anterior nares and hands of health care workers in university of Uyo teaching hospital (UUTH) Uyo, AkwaIbom state, Nigeria. J Bacteriol Parasitol 2013;4:168. Cirkovic I, Stepanovic S, Skov R, Trajkovic J, Grgurevic A, Larsen AR, et al. Carriage and genetic diversity of methicillin-resistant Staphylococcus aureus among patients and healthcare workers in a Serbian university hospital. PLoS One 2015;10:e0127347. Singh S, Dhawan B, Kapil A, Kabra SK, Suri A, Sreenivas V, et al. Coagulase-negative Staphylococci causing bloodstream infection at an Indian tertiary care hospital: Prevalence, antimicrobial resistance and molecular characterisation. Indian J Med Microbiol 2016;34:500-5. Bouchami O, Ben Hassen A, de Lencastre H, Miragaia M. Molecular epidemiology of methicillin-resistant Staphylococcus hominis (MRSHo): Low clonality and reservoirs of SCCmec structural elements. PLoS One 2011;6:e21940. Emaneini M, Jabalameli F, Rahdar H, Leeuwen WBV, Beigverdi R. Nasal carriage rate of methicillin-resistant Staphylococcus aureus among Iranian healthcare workers: A systematic review and meta-analysis. Rev Soc Bras Med Trop 2017;50:590-7. Kaur DC, Narayan PA. Mupirocin resistance in nasal carriage of Staphylococcus aureus among healthcare workers of a tertiary care rural hospital. Indian J Crit Care Med 2014;18:716-21. Bauer AW, Perry DM, Kirby WM. Single-disk antibiotic-sensitivity testing of Staphylococci; an analysis of technique and results. AMA Arch Intern Med 1959;104:208-16. Clinical and Laboratory Standards Institute. Approved standard: M02-A10. Performance Standards for Antimicrobial Disk Susceptibility Tests. 10th ed. Wayne, PA: Clinical and Laboratory Standards Institute; 2009. World Health Organization. Clean care is safer care. In: Sudan R, editor. Report on the Burden of Endemic Health Care-Associated Infection Worldwide: A Systematic Review of the Literature. Geneva: World Health Organization; 2011. Rongpharpi SR, Hazarika NK, Kalita H. The prevalence of nasal carriage of Staphylococcus aureus among healthcare workers at a tertiary care hospital in Assam with special reference to MRSA. J Clin Diagn Res 2013;7:257-60. Kumar P, Shukla I, Varshney S. Nasal screening of healthcare workers for nasal carriage of coagulase positive MRSA and prevalence of nasal colonization with Staphylococcus aureus. Biol Med 2011;3:182-6. Agarwal L, Singh AK, Agarwal A, Agarwal A. Methicillin and mupirocin resistance in nasal colonizers coagulase negative Staphylococcus among health care workers. Med J DY Patil Univ 2016;9:479-83.